Pontoon boats are one of the most versatile sporting boats used for summertime aquatic fun. When you take the pontoon boat out for a spin on the lake, whether you are entertaining a group or going by yourself, the hardest part is always at the end of the excursion when you need to dock the boat. By implementing a few techniques you can easily dock your pontoon professionally and safely without any damage to the boat or the dock. Before arriving 50 feet from the end of the dock, set the engine in an idle position. Coast to the edge of the dock and steer the pontoon boat so that one side of the front of the boat is lined up with the side of the dock. When 15 feet from the edge of the dock, kill the engine on the pontoon boat. Steer the pontoon to line up 3 feet from the side of the dock. Grab the rope on the side of the pontoon boat and wait for the edge of the dock to come within arm's reach. Reach for the post on the dock and pull the pontoon up to the side of the dock. Secure the pontoon with rope at both the front and back and secure. Drop the anchor if needed. Be sure to wear rubber bottomed shoes with good traction while docking the boat, this will prevent slipping and falls. It is best to have a partner when docking your boat, so one can steer and the other can anchor the boat to the dock. 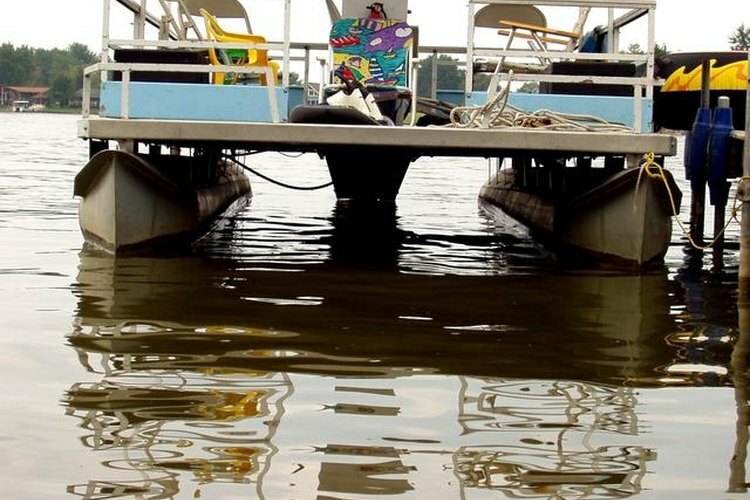 Keep the loading area of the pontoon dry and free of debris. Have passengers remain seated with their arms inside while the boat is docking. Check for stormy weather before venturing out on any boating excursion. Never place hands or feet in between the boat and the docking area as this could lead to amputation.